Earl Hamner - I have just learned that we have lost Ralph Waite. This sudden news is shocking and heartbreaking. Ralph’s portrayal of my father on “The Waltons” was so true, so genuine and so close to the real man that it is like losing my father all over again. Actors have great gifts to give and his gift to me was an image of my father that I will cherish always. Thank you, Ralph and Good Night. Michael Learned - Ralph was a good honest actor and a good honest man, He was my spiritual husband. We loved each other for over 40 years. He died a working actor at the top of his game. He was a loving mentor to many and a role model to an entire generation. I'm devastated. Michael Learned - I'm a little emotional right now. It's such a shock. I don't think people realized the skill behind what he was doing. He had such a great heart. ... Ralph had suffered a lot of great tragedy in his life, but he always overcame it and was there for everyone. I just will miss him terribly. We were kind of like a celibate husband and wife. We never crossed that line, but we were dear, loving friends. Richard Thomas - I loved Ralph very much. He was a fine and funny man with great social consciousness and a big heart. And he was one of the most uncompromisingly honest men and actors I've ever known — a great example for a younger performer. Goodnight, Daddy. Judy Norton - There are no words to express the loss of Ralph Waite. My friend, my co-worker, my "Daddy". You will forever live on in my heart and in the lives of all you have touched over your lifetime. We are lucky to have known you. R.I.P - good night. Judy Norton - Gone too soon. Judy Norton - We were a real family. It wasn't just a group of people who got together and worked and then went our separate ways. We have all stayed in contact very much over the years. We were all together again just a matter of months ago. From the beginning there was a special quality to the group. When we were on the set we looked to Ralph onset as a father figure. Judy Norton - I have been reading many of the beautiful comments sent to me by fans of #‎TheWaltons and of #‎RalphWaite As part of his TV family for over 40 years, I am deeply touched to see that everyone loved him as much as I did. I hope his personal family are also having a chance to experience this outpouring of love and admiration. Thank you for helping to celebrate the LIFE of this very special man. 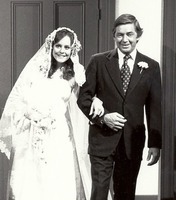 Mary Beth McDonough - I am devastated to announce the loss of my precious “papa” Walton, Ralph Waite. I loved him so much; I know he was so special to all of us. He was like a real father to me. Please keep his family in your prayers. Goodnight Daddy. I love you. Mary Beth McDonough - Can't sleep, so I thought I would share this with you. I am so grateful Michael Learned, our “Mama” had us all over to dinner recently. We all signed a photo for Ralph, each expressing what he meant to us, and our love for him. I know he knew how we loved him. He held court that night asking each of us ( and our spouses) how we were and what we were up to. It was almost like he was catching up and saying good-bye. Such a fond memory. Rest in peace dear, sweet Daddy Ralph. Mary Beth McDonough - I wrote about this photo in my book. This was the day I told Ralph, " You are the only Dad I have left." It was right before he walked me down the aisle for this scene. It was emotional to me then and it hits me hard now. Mary Beth McDonough - When I couldn't sleep, I read your posts. Thank you all for your kind words, love and rememberances of Ralph and all he meant to us and the show. My heart breaks as I remember what he meant to me and all of us. Finding it hard to get to a smile for the great memories today, but there are so many, I know it will come. My love and thanks to you all. You are the best people to support us and care for us the way you do. Mary Beth McDonough - Missing my "Daddy." Such a good man, so talented and so funny. Goodnight sweet Ralph. Mary Beth McDonough - Thanks Teddy, This is beautiful. I love seeing these photos and Idid love The Dance. Perfect. I am so Blessed I had this dance with this special man ( Daddy) Thanks for sharing this with me and all of us. Mary Beth McDonough - "Thought I would share one more fun photo of my "Daddy." This is from one of the movie of the week specials we did. Can you guess which one?" Eric Scott - Sad news to share. .. Ralph Waite passed away today. I will miss my other daddy. Good night Ralph. Eric Scott - Happy times with Daddy! 18 months ago at our 40th Anniversary celebration. Daddy and Ben together again. Ronnie Claire Edwards - Thank you all so much for you condolences. Ralph was a fine actor and a wonderful friend! Leslie (Winston) Yannetti - Time marches on and the world continues to evolve, but sometimes you just expect certain characters and the people who brought them to life to always be in our midst. While the character "John Walton, Sr." will live on forever via film, we sadly lost the man who brought him to life this morning. The character himself is older than I am... one I grew up with and grew to greatly admire. Thus the thought of such is sobering. Sympathies to his wife Linda and family as well as his television family Michael Learned, Mary McDonough, Judy Norton, Kami Cotler, Jon Walmsley, Eric Scott, David Harper and Richard Thomas. Ralph was a fun and kind man who I feel particularly over these last many years grew to fully appreciate the impact his career and friendship had on so many people the world over. For me, I grew up watching the series... always admired "Pa Walton." Never in my wildest dreams as a kid growing up in Virginia did I think I'd actually be blessed and honored enough to know Ralph the man. He will be missed by many... the chilly winds here in Virginia are whipping with sadness tonight. Good Night Ralph. Martha Nix Wade - Ralph was gentle and kind-hearted. Thankful to have been blessed to work with him. 2 of which added a comment and praise for the creator, Ray Castro. Please view the comments, and then the video below. Mary McDonough - A beautiful tibute to Ralph Waite made by Ray Castro. Footage from the 40th reunion is included. Thought you would like this. Eric Scott - A wonderful tribute to Ralph from the 40th Anniversary celebration. Thanks to Ray Castro. Kami Cotler - Someone asked me to post this again. Ray Castro put this tribute together.